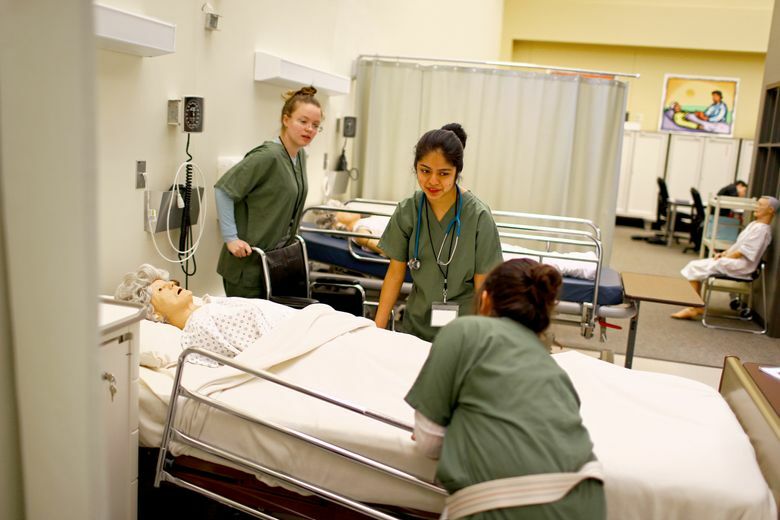 Washington could be doing a much better job of helping students build career and technical education skills, a new state auditor’s report says. Washington could be doing a much better job in its high schools and community colleges to guide students toward careers that pay well but don’t necessarily require a four-year college degree. That’s the conclusion of a 78-page report by the state auditor’s office, which makes specific recommendations for how to improve the state’s system of “career and technical education,” or CTE. In a growing recognition that not all students need a four-year college degree to get a good job, the report urges school districts and the state’s education department to help schools offer classes that teach high-demand skills, and to make sure students in all parts of the state have access to those classes. It also recommends that the state’s K-12 system offer a new course in seventh or eighth grade to get middle-schoolers to begin thinking about what they want to do with their lives. The overall goal, said Christopher Cortines, the report’s author, is to shorten the path from high school to a good job. Once known as vocational education, CTE courses today go beyond the training necessary to do blue-collar jobs. They include skills needed for midlevel and professional jobs — jobs that often require a community college or bachelor’s degree. A little history: In the 1970s, there was a nationwide movement to encourage all high-school students to go to college, says Anthony Carnevale, director of Georgetown University’s Center for Education and the Workforce and a national authority on the subject of education and workforce training. The trend was prompted in part by a growing number of jobs that required employees to have a higher level of education. There also was widespread concern about the lack of equity in high schools — the recognition that minority and low-income students were frequently tracked into vocational paths, while white middle- and upper-income students were encouraged to go to college. In this state, only about 31 percent of students who start ninth grade in Washington public schools have earned a postsecondary credential seven years later. Some drop out of high school before earning their diploma, some don’t enroll in any additional training or a college after high school, and some never finish that training or college degree. A previous state audit report pointed to a potential solution, Cortines said. It found that students who took two or more CTE courses in high school often landed better jobs, even if they didn’t go to college. CTE courses now offered in high school include accounting, welding, auto-body repair and computer networking. But the auditor’s office has found that these courses aren’t offered consistently across the entire K-12 system, leaving some kids at a disadvantage. The auditor’s report lines up with (and quotes from) a recent report from the Washington Roundtable, a business group, which found certain types of jobs are going unfilled because employers can’t find people with the right skills. The auditor’s report also notes that the state of Ohio has done good work in this area. Ohio focuses on offering the most common courses that are necessary to earn nationally recognized industry credentials in fields such as nursing, welding and automotive repair. Students who take those courses in Ohio earn both high-school and college credit, which is recognized at all of the state’s community colleges. The auditor’s report points out that Washington has an average of just one school counselor for every 500 students; the American School Counselor Association recommends a ratio of 250-to-1. And Cortines said the auditor’s office found that those counselors tend to steer students to four-year degrees, rather than CTE careers. If parents don’t feel like their children are getting enough career guidance in school, Cortines said, they can use the Washington Workforce Board’s Career Bridge website to provide some of that help. The site is a career-guide tool that offers an overview of careers and job trends, and shows the kind of education needed. “I would look at that, and scrub it every which way, and try to connect my child’s interests with different paths and occupations, along with an awareness of what it costs” to attain some of the training needed to do those jobs, he said. Kathleen Cooper, spokeswoman for the auditor’s office, also recommends exploring what’s offered at the state’s 14 skills centers — regional secondary schools that offer CTE programs that are either too expensive or too specialized for individual school districts to provide. The Seattle district has its own, the Seattle Public Schools Skills Center, which offers courses in such varied fields as construction, video game production, teaching and fire science.